There is a Christmas tradition that supposedly originated in Germany, though no German family I know has ever heard of it. My mother certainly never has. It is the legend of the pickle ornament. Supposedly a Christmas ornament in the shape of a pickle is hidden somewhere on the tree by parents and the first child to find the pickle gets to open the first gift from Santa. Upon researching this legend on the web, I have found abundant evidence that it is not a German custom. 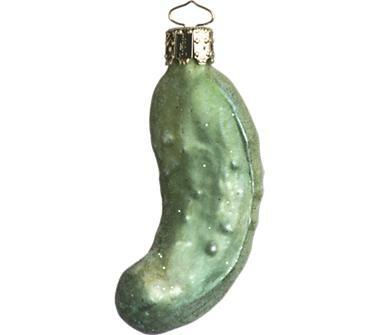 Every site I checked said every native German they checked with had never heard of the pickle ornament. So there. It's confirmed. As it happens, I was at an ornament exchange party on Monday evening and the host described this tradition to us before having a draw to win a pickle ornament. I won the pickle ornament but found the German tradition story a bit dubious - glad to have that confirmed. Not sure that I'll bother hanging it on our tree. Merry Christmas!! @Lisa - that's quite a coincidence! Funny that so many people think it's a German tradition. What an interesting looking ornament! Although, it sounds like a great way to determine who opens presents first. Thanks for the info! I had always heard the same thing that pickle is German tradition but my sister spent Christmas in Germany last year and couldn't find one to bring home! I wonder where the idea actually originally came from. Hi Sonja, Here's my follow-up story. We were at Disney over the holidays and went to the World Showcase at Epcot. In Germany there was an entire tree covered with pickle ornaments and a little sign on the tree describing this German tradition. We then popped into the shop next door for Emma to get her passport stamped so I asked the two young German people working there if it was really a German tradition. They told me they didn't know anyone in Germany who hangs a pickle on their tree but for some reason Americans like to think that it's a German tradition! I LOVE that you followed up on this! Fantastic - and proves my point! Thank you and happy New Year, Lisa! Actually, my grandparents, who were born in and lived in Germany before moving to the US when my mother was 4 always did the pickle tradition. For the longest time growing up, I would ask - why is there a stupid pickle on our tree? Also, my grandmother always had the elf (like the elf on a shelf thing) with a similar story, although not involving Santa, as well.